As with all movies that kill off their prime properties in the first installment, this sequel to GAMERA (1965) must retro-activate a trashy pulp retrieve of its dead star attraction. So (in the American version at least) there is the sweaty-mouthed, talk-fast-so-no-one-will-notice introduction narration: Gamera, the destructive prehistoric turtle hatched from slumber by an atomic bomb, was cocooned in a rocket after his rampage through Japan, and blasted to Mars. However, out there in the vastness of space where anything can happen, mind you, a meteor impacted the rocket – releasing Gamera, who promptly flew back to Earth and broke more stuff. Bad turtle! Okay, that takes care of the first five minutes’ padding. What now? As it happens, writer Nisan Takahashi manages to write a reasonably watchable actioner, with a plot about human greed and treachery, and a big monster birthed by radiation that destroys Japan. Trouble is – Gamera isn’t involved! The giant irradiated monster is a dog-alligator-thing with a freeze-ray tongue called Barugon. Kids, if you came to see Gamera Friend To Children, you snuck into the wrong drive-in movie. The Shelled One doesn’t appear again until a few minutes before the end, to kick some Barugon and take some names. Turns out the opal was really an egg. It hatches Barugon, who grows to Japan-destroying adulthood overnight (again, don’t ask). Thus, it begins: As Godzilla got stuck battling other monsters without the hindrance of plot, now the Gamera creators trap themselves on that same treadmill, in this first sequel, already bowing to that convention. It’s either a shark-jump or the cutest, fluffy-poniest way to get killed ever! From Barugon’s back, a rainbow arcs across the sky [twinkly sound] and touches down, killing everything in its path. What genius at Daiei Studios thought up this gem? Now I’m rooting for the monster! 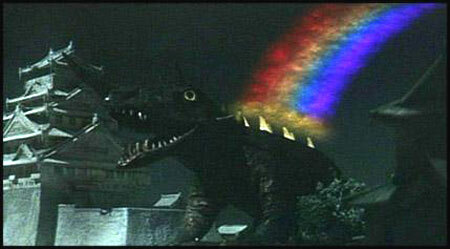 And the best part about GAMERA VS. BARUGON – no Annoying Kids! A staple feature of all daikaiju movies, no pokey-nosed, tight-panted brats are here superfluously, to tell the army what to do, or to yell and wave, “Gameraaaaaaa! Gameraaaa-san daikaiju ooouwah!” and wipe their snot on my car seats. The humans find a way to combat Barugon by using mirrors against his rainbow. And then Gamera turns up out of nowhere and drags Barugon out to sea. It’s quite a tragic end, as we see one last rainbow shoot up from beneath the waters… [twinkly sound and silent tear]. aka: DAIKAIJÛ KETTÔ: GAMERA TAI BARUGON. Starring: Kôjirô Hongô, Kyôko Enami, Yûzô Hayakawa, Takuya Fujioka, Kôji Fujiyama, Akira Natsuki, Yoshirô Kitahara. Version: MST3K edit, English dubbing.